Bucharest is the most lush, sweet and pleasing-to-the-eye city I’ve visited and the best part is that nobody “knows” about it. What I mean is that you don’t hear many people talking about their planned trip to Bucharest or other parts of Romania. The lack of hordes of tourists is what makes this city even more fun to visit. There is no standing in line for two hours to visit the Eiffel Tower, the London Eye or to catch a glimpse of the astronomical clock tower in Prague. Bucharest is such a huge city with many wide boulevards and parks. All the major streets are decorated numerous beds of colorful flowers and there are flower shops at nearly every corner. It adds to the beauty and the great smell of the city. Go ahead a splurge on a cab because there are over 10,000 in a city of 2 million people. It’s easy to find 3-4 cabs waiting along a main street. For a short trip of about 15 minutes it costs roughly 2.50 Euros with tip! A ride is much more enjoyable in a cab so you can roll down the window and stick your head out like a puppy dog drooling over all of the amazing architecture. One of the most beautiful is the Athenaeum, the city’s main concert hall, which opened in 1888. The front façade features the faces of Romania’s five kings. 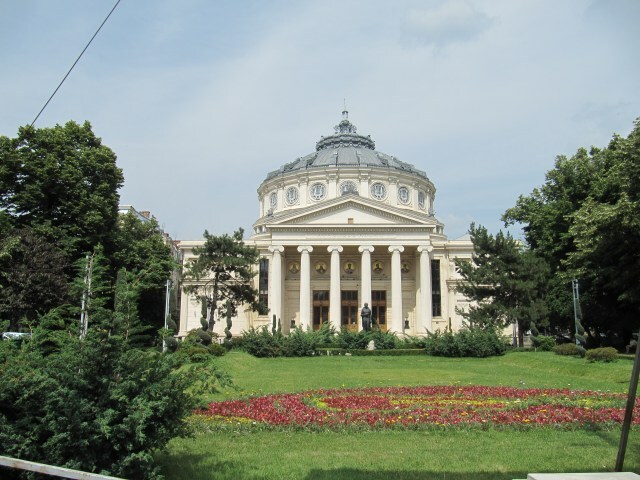 Another major landmark is the Casa Poporului (Palace of the Parliament). 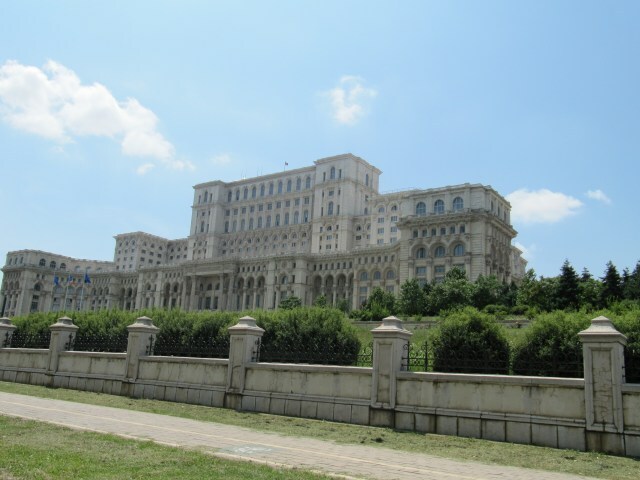 While it is impressive being the world’s largest and most expensive civilian administrative building, not to mention the heaviest, its construction involved demolishing much of Bucharest’s historic district including multiple churches and approximately 30,000 residences. 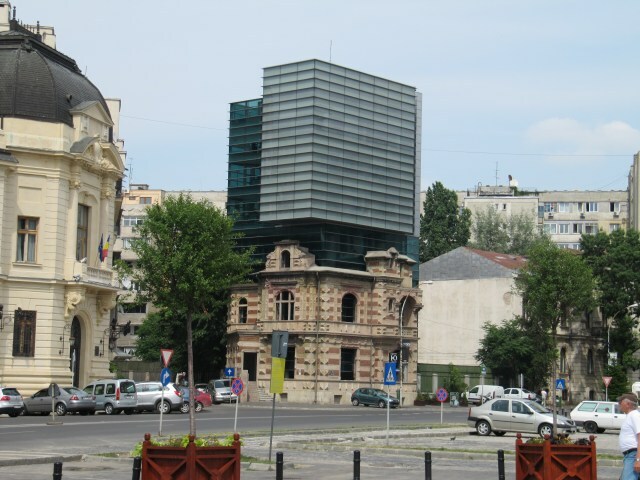 This building is one of the main reasons Bucharest has so many stray dogs roaming the streets. The architecture is also fascinating with its white buildings and the characteristic arch motifs. There are some buildings that even look Parisian. 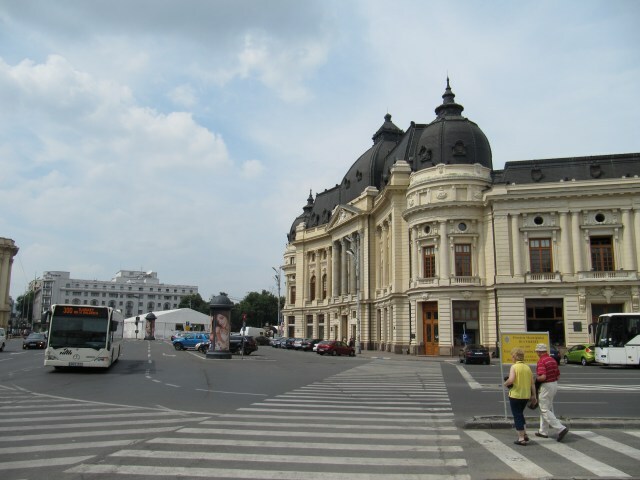 In the period between the two world wars, Bucharest was known as the “Little Paris of the East”. I have to say that it isn’t so little and to me it has even more character than Paris. (Its Europe’s best kept secret). 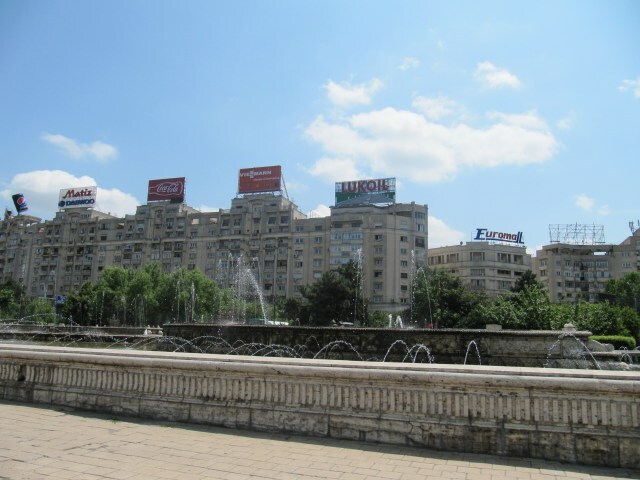 In addition to the neo-classical architecture, Bucharest also has a mix of communist style apartment buildings and some shiny modern buildings, which adds to its unique character. After touring the city, head to the old city center and order a Romanian beer (such as an Ursus or Silva) in a 0.5L bottle or cool down with a frappe because it’s so hot in summer you’ll need it. The patios in Bucharest are unlike any others I’ve seen in Europe. They are completely different from the French-style patios, which have tiny tables and tiny chairs on the uneven cobblestones next to the street. Bucharest has luxurious patios with large chairs covered with white cushions and tables big enough for four people to eat comfortably rather than merely placing a beverage on it. You will find many restaurants with wooden patios filled with flowerpots and other vegetation. Making it better than sitting in anyone’s personal garden and in summer they even have built in misters that help cool the temperatures. Many of the restaurants themselves are gigantic houses; one of the most popular is Caru cu Bere. One thing to be prepared for before going to Bucharest is that you should have a comfy hotel bed because you will most likely, more than once, eat yourself into a near comatose state. The food is so delicious and served in such large portions after your done eating your done for the day. All you can do is lay down and sleep it off. Romanians tend to eat their largest meal of the day at lunchtime where it’s not uncommon to have at least a three-courses. If you want a traditional Romanian lunch, you can order a starter such as ciorba (sour soup) or vinete (eggplant salad) and then a popular main course is fasole cu carnati (beans and sausage) or a pork steak with cabbage salad. Then you top it off with a rich desert such as papanasi (homemade donuts). Gaining holiday weight is a given in Bucharest. After your required afternoon nap, you can head out to Herastrau Park, the largest park in Bucharest stretching over 100 hectares. Here you will be enveloped by the natural perfume of the city, which carries hints of the lemon trees and flowers. On the sidewalks in the middle of town you can find cherry trees, blackberry trees, apricot trees and so many flowered trees that it makes you want to “stop and smell the roses”. Herastrau Park is a great place to find souvenirs. Here you will find stands with handmade cookware, clothing and jewelry and Romanian’s are undeniably good craftsmen and artists. You can visit the open-air museum: Village Museum, located in the park, which has multiple traditional Romanian houses giving you a glimpse of how people lived. 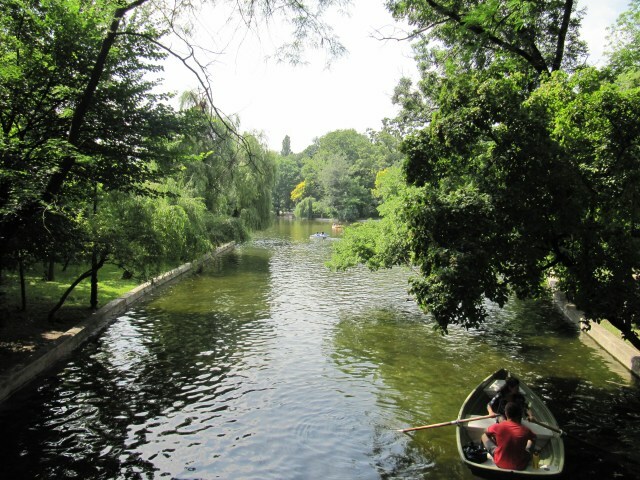 You can also take a rowboat or water bike on Herastrau Lake for 2.5 Euros per hour and watch the sunset. 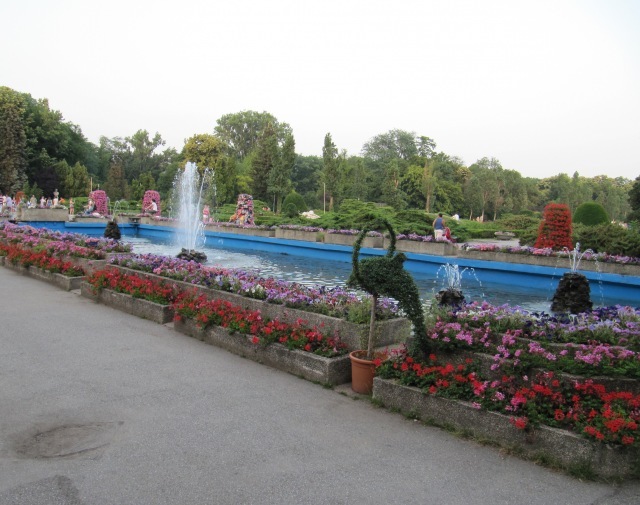 Another beautiful park is Cismigiu, which is highly landscaped and looks more like a garden of the royals. It also has boats you can take out onto its smaller lake. At the end of the evening, if you haven’t consumed enough food yet, you can stop at one of the many bakeries and get a covrig (pretzel) or other warm pastry. The ones with cheese (branza) inside are excellent. You can afford it because you can spend the rest of the night dancing it off in one of Bucharest’s many nightclubs. From dawn until dusk, you will not be short of things to see or do in Bucharest. Unlike other cities, where you see the tourist attraction and check it off your list, Bucharest is a city where you will want to go back and do everything you did the day before again because you just can’t get enough. Growing up in Western Canada, Nicole Basaraba was always skipping to her own beat. Not being a hockey fan, having no skills in skiing or snowboarding, always being cold, and having never tasted maple syrup, she is what you might call a “bad” Canadian. After studying some history in university and always dreaming of seeing Europe, Nicole moved to Brussels, Belgium to live, work, and travel. I would have most likely ever considered Bucharest as a destination in my travels. My mind is now changed – it looks and sounds phenomenal! It really is an amazing city and like Cat said, there are many other amazingly beautiful places to visit in this country. I too have a blog in which I wrote about my recent trip to Romania. What a lovely interesting, tragic, fascinating place. Check it out and go! Love the architecture! Wonderful photos. I went to Romania last summer to attend a friend’s wedding, and stayed in Bucarest for a few days. I completely agree with you, it’s a great city that is worth the visit. I loved the experience. I’ll be uploading some articles about my travels soon, and there will be one about Romania, if you’re interested. Sorry, I meant to write Bucharest ! While I liked Bucharest, I was much more enchanted with the palaces and small towns outside the city. I loved Maramures and Moldova, and spent next to nothng there. Moldova is actually a separate country from Romania, its sister to the North, but at one time it was part of Romania. Moldova is on my travel destination list! Ahhh I realized you probably meant the Moldova region of Romania, rather than the country of Moldova. I haven’t been there, but I’m sure its beautiful. In fact, Nicole, you are right 🙂 and wrong 🙁 at the same time. Moldova is one of the three historical provinces – together with Vallachia and Transylvania – that made up Romania. In 1940 Soviet Union stole half of Moldova, and after giving the Northern and Southern parts of that to Ukraine, formed of what was left the Soviet Republic of Moldova, which became the (more or less independent) Republic of Moldova, in 1991, after the demise of Soviet Union. The Western part of Moldova, on the right side of River Prut is still part of Romania and continue to be called Moldova. It is of this Moldova that Cat is talking. I applaud you for portraying Bucharest so wonderfully. Thanks for doing such an incredible good job in my home town! Those pictures are just beautiful! You’ve just made me want to go there! Great post! I’m dying to visit Romania. Thank you Nicole for writing such a great, unbiased Article. I am born and raised in Bucuresti (now I am living abroad) and I always thought about Bucuresti as a great place. It is a great feeling to see that people which are from other countries and visited Bucuresti (as yourself) could get such a great feeling about this city, when Romanians are always complaining about their own country and cities, “forgetting” to appreciate them to their full value. But when I come now to visit Romania and Bucuresti, I always have the same feeling as the ones described in your Article. And luckily, my parents live 5 minutes away from Herastrau Park:) Thank you again Nicole! If anyone wants some travel tips for going to Romania, please feel free to drop my an email and I’d be happy to help. I’ll definitely put this on my itinerary with my motorhome. “Casa Poporului” is the old Communist name of the building; it literally means “The People’s House”. Not to be confused with the new name of the building: “Palatul Parlamentului” (Palace of the Parliament). “Herastrau Park” in Romanian is spelt “Parcul Herăstrău”. Similarly, “Cismigiu” in Romanian is spelt “Cişmigiu”. Curiously enough, your surname, “Basaraba”, is quite close in both pronunciation and spelling to the name of the former Romanian province of Basarabia, which is now Moldova (The Republic of). Coincidence or not, your surname’s origin should be worth looking into. Loved this post! I’ve always wanted to go to Bucharest and after this post it reminds me of my favourite city – Budapest. Bucharest is a beautiful city! We thoroughly enjoyed it. After 3 of my sisters and I toured Western and Southern Europe I wanted to see Eastern Europe, too especially Prague known as the “the old Paris.” Now, because of your intriguing blog, I want to check out Bucharest. My bucket list? Beautiful post. Beautiful pictures. Beautiful Bucharest. I am ready to pack my bags and go. I’ve been to Western Europe, but I also hope to visit the East one day. The mix of the old and new are wonderfully captured in your pictures. I love the pictures of the gardens in the park and the river. Thank you for sharing! I’m so glad to read those wonderfull words about Romania 🙂 Thank you! Thanks for doing justice to my most fave city ever! I love checking out your site – you get up to so much! We just got back from Madrid where we went for a short break which we really enjoyed. We really fancy going to Bucharest and it’s one of the destinations we’ve been looking into but whilst in Madrid we got talking to a Romanian who told us not to bother – he said it was (and I quote) ‘a very grey city’. I can’t deny that his comments put me off a bit so I’m quite glad to read your review – it’s made me get back on track with it. This is a fabtast article, thank you. I am akways on the hunt for new places to visit that are less overwhelmed with tourism…I think this may well be my next stop! I was amazed to see that there are foreign people who really love Romania and apreciate Romania. In Europe, Romania is known as be one of the poorest and corupted countries, which phisically is not far from the truth. But this is not because of the romanian people, but because from other causes I will not mention here. One of the best things in Romania is the fact that until 18th century between 80 and 90 percent of the country were covered by forest. This kept the culture and the religion intact in its own cradle from the very old times. I reccommend the old history of Romania, it is fascinating and you can find it everywhere if you know where to search for it. Wish you all the best! Your article made me see Bucharest, where I have lived for 4 years, in a different more positive light. When I will go back there, I will definitely be more excited about living there. 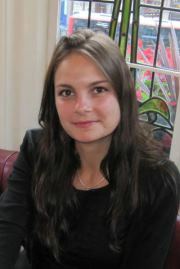 Hope you will come back to Romania, it really has a lot of great things to offer. Cheers! Hey nice articol, I was born in Bucharest and I lived there for 15 years. I recommend you to visit Cluj-Napoca and Sibiu, two cities form Transylvania. Now I live in Cluj ’cause I’m a student here. Cluj and Sibiu look like more “european” Sibiu was a German City and Cluj Hungarian. 🙂 Bye ! Alex, for a romanian guy is embarrassing to make the afirmation that Cluj and Sibiu were hungarian and german cities in the middle of Romania. As a student is more embarrassing not to know the history of Romania. I understand the context you are trying to expose here, but you are very far from it. Tks for review. I’m a romanian, i live in Romania. I’m so glad to see good reviews about my country. A great post. It reminds me a lot of my trips to Bucharest and the homeland of my lovely wife. SOLD! Now I want to visit Bucharest. Is it safe for a family? I love Eastern Europe. I’d love to see some photos of the cafes. Your description makes it sound very interesting. As far as I saw, Bucharest is very safe. Depending on where you are from, you may have to be a bit more careful of being taken advantage of by some locals. Romanians themselves will be able to give you a better idea on the “scams” that people can be subject to. Using common sense will prevent being scammed. I’ve got a few other posts about Romania on my blog. I should do a post just about the patios though. They are to die for. If you loved that you should try visit Lithuania. Its capital – Vilnius, is astonishing and other cities, towns and rural visiting sites makes you experience something really unique and understand how one country can be so culturally developed, but so naturally and ethnically inspiring at the same time! Actually Lithuania is already on my travel list! Thank you. I was in Bucharest in January 1994. It was a dreary, bitingly cold overnight stay around the train station as I awaited a train that would take me to Budapest. I felt overwhelming heaviness of heart as I observed around me. I did not have the opportunity to see any of the beauty and poignancy of Bucharest. I definitely would like to go back. Twenty years is a long time in the life of a city. Thank you for writing this article Nicole! As Romania is becoming a well known touristic destination, so is Bucharest and all it’s attractions. And as some of you have already mentioned, Bucharest’s charm lies not necessarily in it’s sightseeing but in it’s stories and way of living. That’s why some of us locals have gathered together to form BUCHAREST GREETERS, which is a volunteering programme offering FREE TOUR GUIDES but most importantly we offer the chance for tourists to hang out with locals and hear their stories. It’s a great way to uncover the city’s uniqueness. If you’re looking for a unique experience and want to SEE FOR YOURSELF what Bucharest has in store or if you want to become part of our volunteering team you can get in touch with us at http://bucharestgreeters.ro/ or check out our Facebook page https://www.facebook.com/bucharestgreeters . We’re looking forward to sharing our passion for the city where anything is possible – Bucharest! BUCHAREST GREETERS is a proud member of the Global Greeter Network.